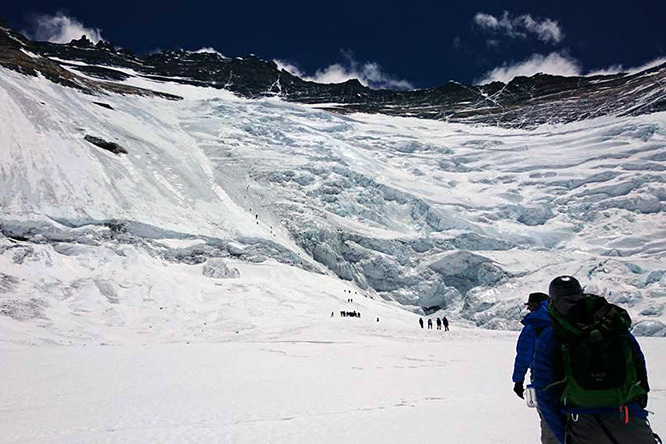 After the icefall, the Lhotse Face is probably the next most famous part of climbing Everest from the south side. 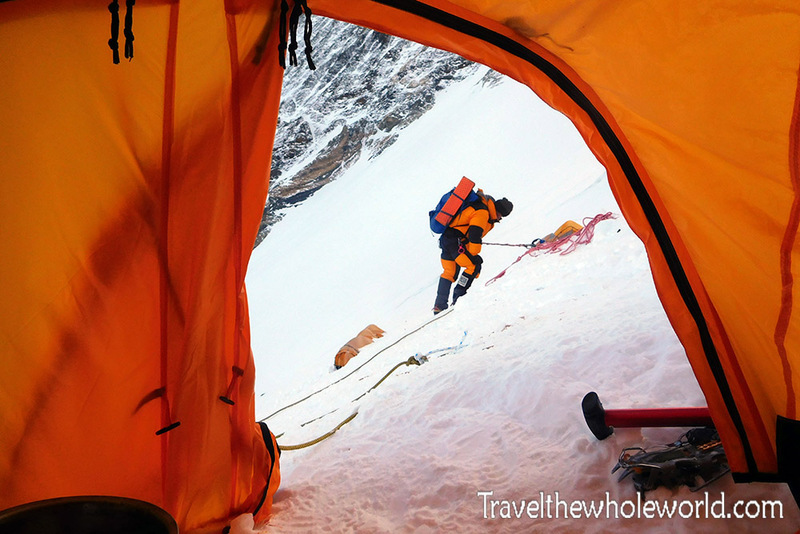 Climbing the Lhotse Face can be dangerous because of the high chance of avalanche and constantly falling rocks. 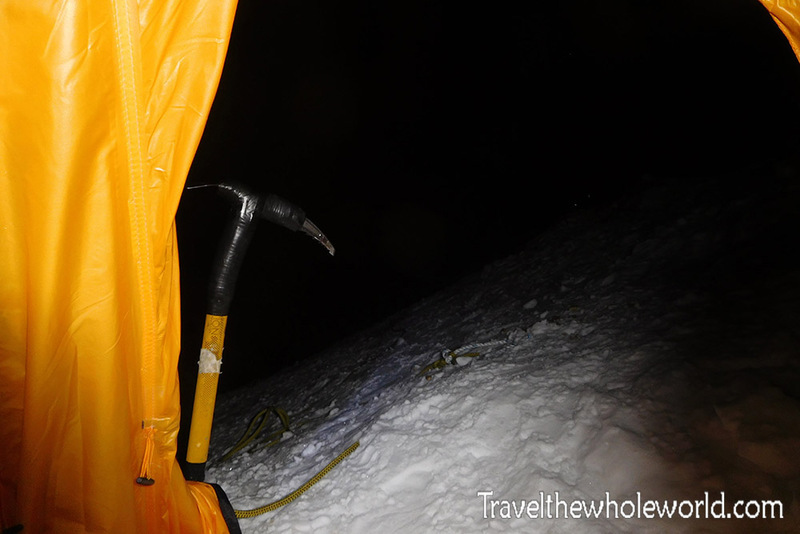 As a matter of fact, one of our Sherpas on our expedition once had his head cracked open by a falling rock. Apparently he was running around screaming wanting a rescue. The head Sherpa responded that if he could run around like that then he could make it back to base camp. Eventually he did get rescued from Camp II and flown to Kathmandu. 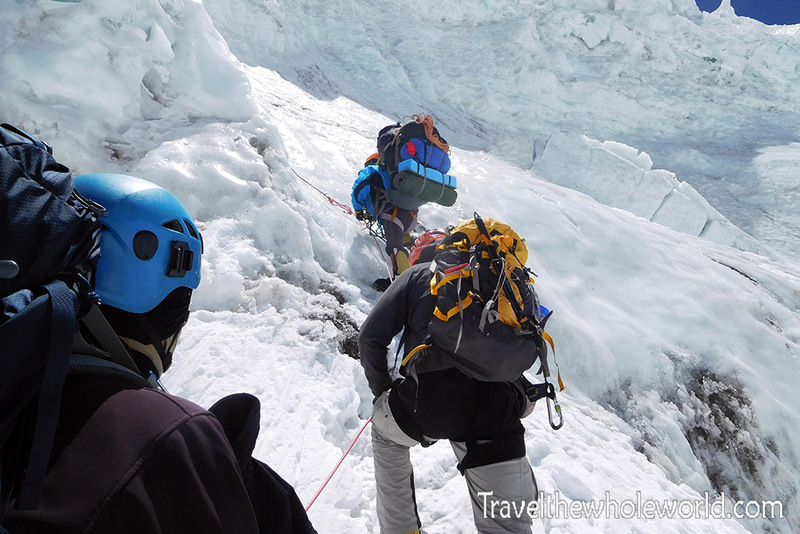 The photo above shows our expedition approaching the Lhotse Face for the first time, I’m the person at the very back with the green backpack! Camp III is visible from Camp II if you have a decent zoom lens or great eyesight. With Camp II at 21,500 feet (6,500 meters), it’s still a good bit of vertical distance to Camp III at 23,500 feet (7,100 meters) despite how close it looks. 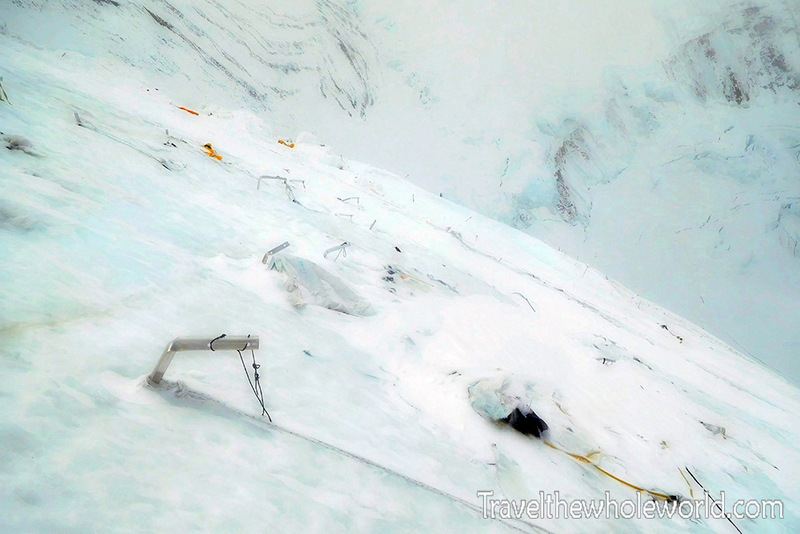 This shot above shows Camp III on the Lhotse Face at full zoom and was taken while I was still in the Western Cwm. 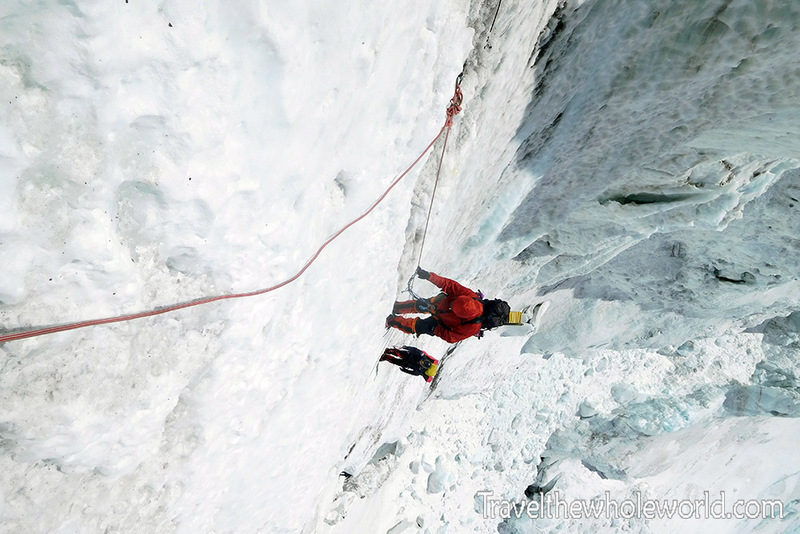 The photo below shows the entire Lhotse face without zoom. From Camp II you still have the to finish off the last bit of the Western Cwm before you arrive to the base of the Lhotse Face. 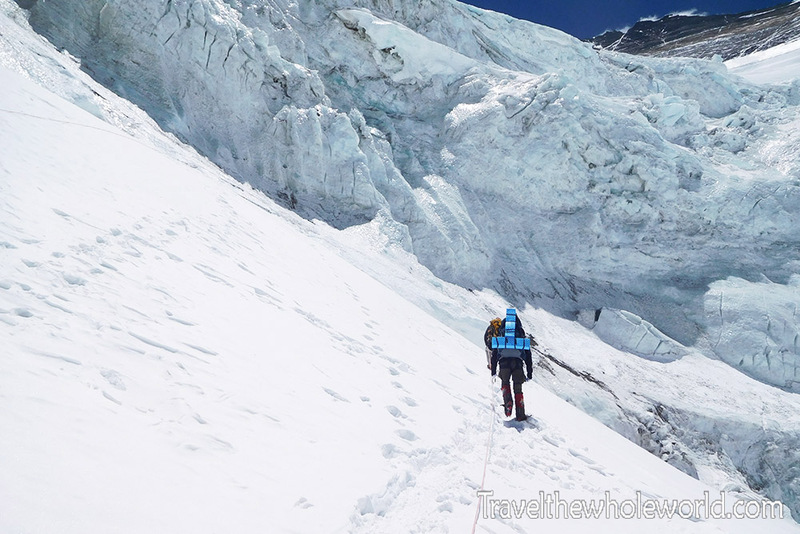 The remaining part of the Western Cwm is still a gentle slope for the most part, and you’ll ascend almost 1,000 feet (250 meters) before getting to the bottom of the Lhotse Face. The photo above shows my team at the very end of the Western Cwm with the steep climbing just ahead. 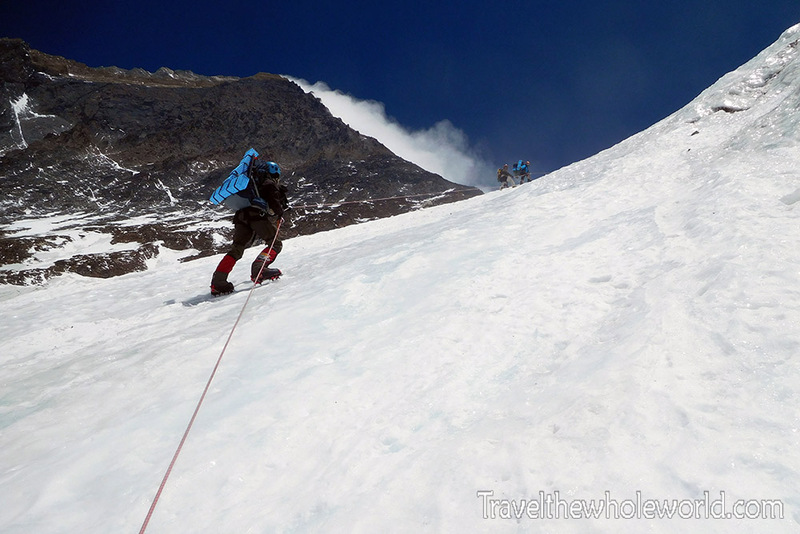 In the photograph below, we just started our first ascent up towards Camp III. This was the first picture I took while actually climbing the face. I ended up doing the Lhotse Face twice. Once was to acclimatize and the second time when going up for the summit. The first time the route was nothing but ice, and I found this area above to be the hardest part. I did not rotate this photo or manipulate it in anyway! Although it looks like a vertical climb, it was not as dramatic as it looks in the photo. The second time we came up the face, it was covered in deep snow which made the climb much much easier. This picture was taken right after the difficult section that I had just described. It looks flatter than it actually in the photo, so the truth is somewhere in between. From this point the incline stabilized and the rest of the way to Camp III didn’t get easier or harder for the most part. Rock falls were a serious problem though. One of my friends got hit in the arm and I got hit in the chest. The ones that missed me whizzed by my head but sadly weren’t loud enough for my Gopro to capture them. See the video of that below. Because we were around 23,000 feet (7,000 meters), the ascent was very slow and steady. Even when we got close to Camp III, we continued at a snail’s pace stopping often to rest despite being only 10 minutes away. The photo above shows part of Camp III. In base camp we each had our own tent, but in Camp III we had two or three people to a tent. 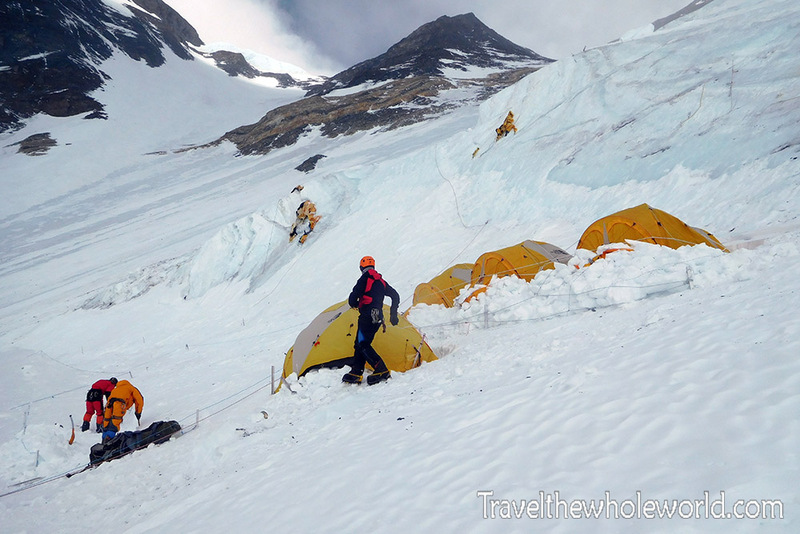 Camp III is by no means an ideal place to spend the night, it only exists because it’s way too long of a climb to go from Camp II straight to the South Col.
Camp III has a very high avalanche risk and it’s a dangerous place to be because it’s so steep. Just going outside of your tent unroped can be risky, because any fall can take you all the way down the mountain to your death. As a matter of fact, the second time I went up the Lhotse Face I found a man who had just fallen to his death about 20 minutes earlier. These photos above and below are two shots I took while laying in my sleeping bag. Above you can see a random climber passing by. Below is is a night shot that I took. Case in point, just outside of Camp III you couldn’t miss previous tents and gear that were destroyed from previous avalanches. The photo above was taken on my way down the mountain after I went up to the death zone, where it damaged my camera so it’s a bit blurry. You can still make out all the bent pickets and other gear buried in the snow. 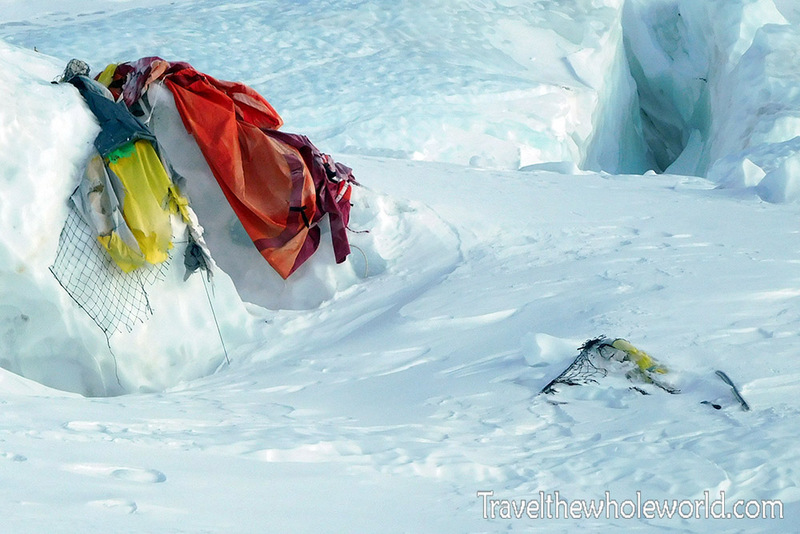 Below are the remains of some tents from other expeditions. I hope no one was in them at the time of the avalanche. The first time we slept at Camp III we did so without oxygen. Although I didn’t have any altitude problems, sleep was absolutely terrible at this height. I would seriously fall asleep and it would feel as if two hours had passed by. After waking up I’d look at my watch to find that not even ten minutes has passed! It went like this through the entire night, and in the morning it turned out that everyone had had the same experience. The second time in Camp III I slept on oxygen and felt relatively normal. The photo above is me after making some adjustments on my regulator. 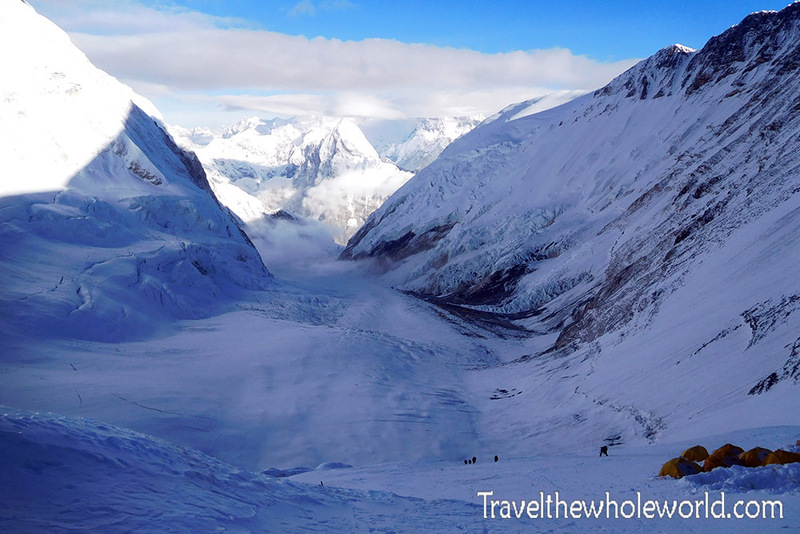 From the Lhotse Face, you can see the entire Western Cwm easily. It’s absolutely amazing to see this with your own eyes. Also if you consider how long the Khumbu Valley is, which we essentially hiked all the way up from Lukla, this is the final terminus once it hits the face. Just off to the right in the center of the photo, if you see that dark area that’s about where Camp II is located. 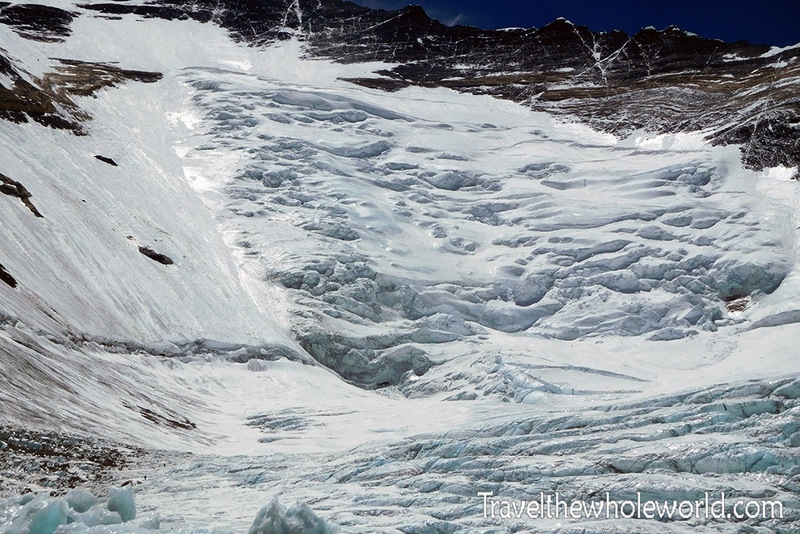 From there the Western Cwm continues to slope downwards until the ground becomes unstable and then you enter the Khumbu Icefall. 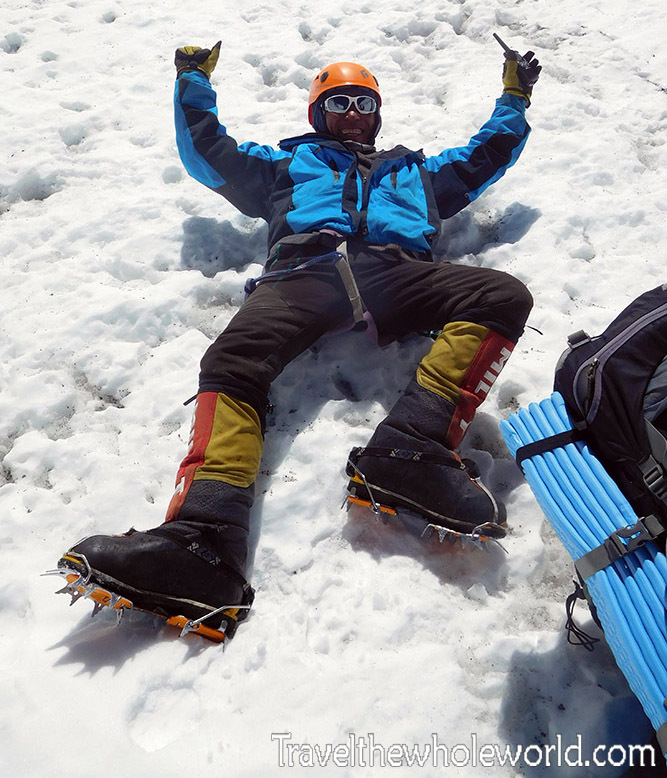 The photo below was of one of our Sherpa’s celebrating are safe descent the first time we returned from Camp III. 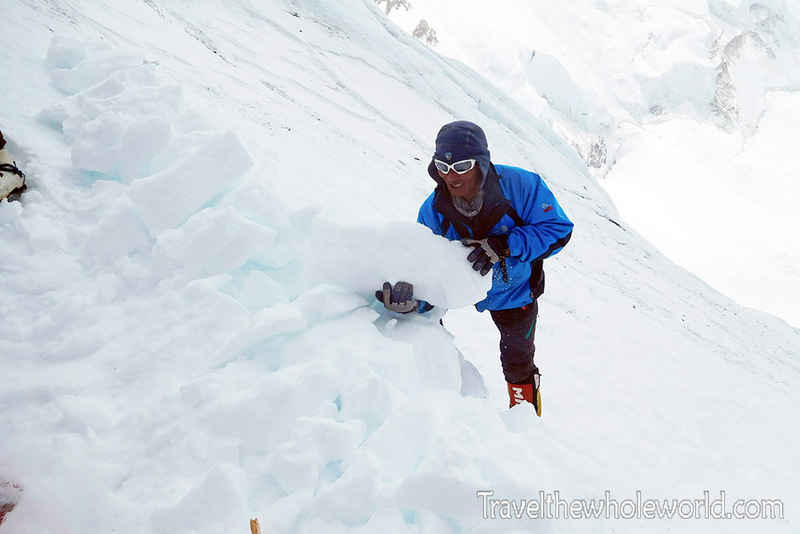 Click here to see Everest Summit Day!